Wow that looks like some serious track he has going on there! 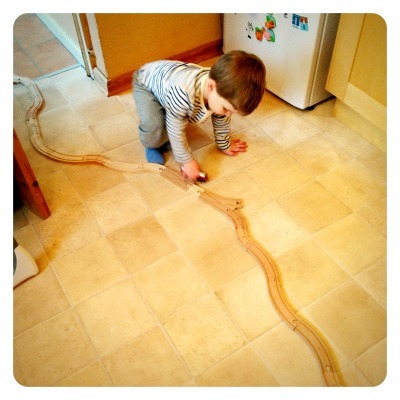 That looks like a brilliant track – we have lots of track in our house too. yes we have 3 sets of brio train track that Bob assembles and runs under and round things. Him and his sister at 6 and 9 still play with it most days they here, it even goes out in the garden. love it! we have a train set passed down from my 16 year old nephew!